This intensive weekend lab is ideal for those who would rather take all our classes in one weekend.This will be the perfect opportunity to work in our kitchen, learning the soap making craft, creating and having fun with ingredients that will build your experience and help guide you to achieve your goals! • Soap 101 – Learn the basics of cold processes soap making. • Aromas – Understanding and working with essential oils and fragrances, creating your own scent. • Carrier Oils –Which make outstanding combinations for different skin types. • Additives – Which are the best fit for your needs and effects. • Herbal Infusions –Remedies that help. • Salves – Combining necessary ingredients into healing. • Soap 201 – A more in-depth recipe building and formulation experience. • Soap techniques – Fun experimenting with colors, swirls, textures, layering and effects. • Concept to design – Thoughtful outcomes, packaging and branding concepts. We supply everything you need and you don’t need to bring anything but your happy self. Our material fee is always included! You will go home with thorough handouts, tested recipes, clear instructions for everything we make, and finished products. Students receive special weekend discounts, a binder and certificate of completion. Cost: $350 Limited to 6 people. Learning to make soap is fun, exciting, and unique! This beginner’s level class is great for anyone who wants to learn something new, meet new people, and make soap at home to give as handmade gifts. 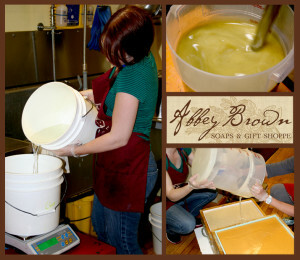 This class covers the Cold Process method of soap making wherein we will learn about lye safety, necessary equipment, vegetable and plant based oils, and essential oils for scenting bars naturally.This class combines lecture, demonstration, and a hands-on portion during which we will make three large batches of soap together. Students leave the course with handouts, a bar of olive oil soap, and lots of new knowledge to take home! For those students who loved our Soap 101 course and want to learn more! We suggest you take this course after having made soap at home at least once. Bring your bars in for a critique session that is a valuable and enlightening part of this class! What did you do right? What didn’t work? And why? During the hands-on portion of this class, you will choose one of three provided recipes and work with a partner to create a small batch of soap together with the guidance of our instructors. Students will leave with handouts, take home containers of the soaps made during class, and even more confidence to continue making soap at home! In this class you will learn all about the characteristics and benefits of various vegetable and fruit based oils and essential oils. You will learn the techniques for combining, scenting, melting, and pouring balms and oils to use as natural alternatives to commercial lotions and other moisturizers. We are now also adding herbal infusion into this class – we will talk about natural herbs and botanical and using them to infuse the oils you put in your products! All of our classes are held at our 1162 W Grand Ave shoppe in Chicago. We are working hard to provide digital material, videos, and classes to those who can not attend in person. *CANCELLATION POLICY – You can cancel up to a week before the class and get a full refund. Any cancellations after that time will receive a credit for a future class. Classes are subject to cancellation due to low enrollment. You will be contacted in the case of cancellation for the chance to enroll in a future class. Please note that any refund past 60 days, whether due to cancellation on your or our behalf, will be subject to a small percentage fee taken from Paypal. Thank you for your understanding. Do you have any classes coming up ? We currently do not have any classes scheduled as the instructor will be out of town for the month of September. Check back soon for the October Schedule. Thanks! Will you please email me when October 101 classes are available for registration? Thanks! Hi,have the October classes started yet? The instructor just got back into the country today. We will be discussing the upcoming schedule soon and I will be posting it asap. You can also keep updated about classes by liking us on facebook. Thanks! Hi – I’m interested in the Specialty classes: Moisturize, Naturally. Butters and Oils and Infusions classes. Will you be scheduling any soon? The holiday season is pretty busy for us so we will not be offering classes again until the new year. But we have to have a full schedule then! We are two sisters wanting to take the 101 soap making class. Can you give us a conformation back to let us know if we will be in the January 25, 2014 class. Looking forward to it w/ excited anticipation! February 15th @ 1:00 p.m. Can you tell me how we sign up? I look forward to hearing from you. I am very interested in your March schedule, can you please E-mail it to me as it become available. I thank you in advance. How many spots do you have left in the sat February 22nd class? When will you have the Soap 201 class again? Please advise when your next Soapmaking 101 will be held or the weekend lab? We will not have any more Soap 101 classes for the rest of May. I would recommend taking our Weekend workshop class at the end of the month or check back soon for June’s dates. Thanks! Currently pregnant and about to pop. Would love to sign up for lots of classes at the end of June or July. Any dates/schedule for those months yet? Thank you so much for inquiring about our classes. We do not have any dates set up for those months yet, but I will contact you as soon as we do. Thanks! Right now we only plan to do the June 22nd one. During farmer’s market season, classes become more difficult for us to do. We’ll be sure to email you if we do decide to schedule another class before the fall. Thanks! Hi! Would I have enough knowledge after taking the Soap Making 101 class to make my own soap at home? Would I need to use any unusual equipment at home to do this? Thanks. YES! Amy, you most certainly will learn a TON of information in the 3 hour course. You’ll be able to purchase ingredients from us if you choose, and make soap at home with your new found knowledge. can you please advise when is the next soap 201 class? I have been trying to take this class for months now, but I have not seen it scheduled in a while. Hi Juliana-We apologize for the wait. It is difficult for us to fill up a Soap 201 class. We are scheduling one for July 27th @ 2pm. Is the Soap Making 101 on July 27th full? If not, how can I attend? Thanks!! Hi Jenni-Yes it is full. Thank you for your interest in our classes. We will be creating a new schedule soon and will post up the dates ASAP. Thanks! Hi, I would like to sign up for the 2 day workshop. Can you tell me when this will be available? Hi Melissa- Thank you for your interest in our classes. We will be creating a new schedule soon and will post it up ASAP. do you have another soap 101 class coming up besides Oct 26th? Just wondering if you have any classes coming up or a class schedule. Thank you.